This is one little gimmick to KEEP on your emulator/phone! The well-known Fortune "game" for Android. This open-source project started by me is actually quite complete and working already. Grab cookie files of the net and let Android's Fortune show them to you for distraction. 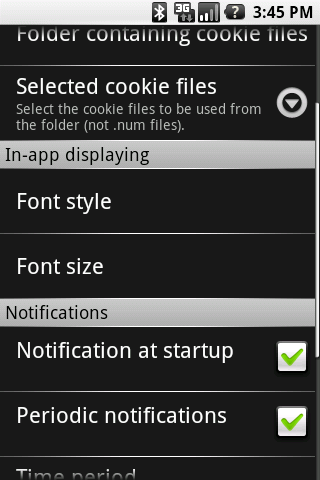 Several options exist to receive notifications of new cookies at several time moments. Also some settings to make the cookies easily readable. Finally an automated version checker (using tomgibara's veecheck) is included so you'll be able to catch up with the latest features. The current state is beta and might need some usability improvement here and there but the general experience should be quite smooth. To be able to do anything useful you can get the sample cookie file "work" that is included, put it on the phone, and set the preferences accordingly. Please do comment, ask, report, join or whatever both on the Launchpad project page as on the Ohloh project page (declare yourself a user! ): https://www.ohloh.net/projects/androidsfortune . Sample cookie file &quot;work&quot; (the .txt was just appended to be able to attach it here). Now you should pimp it a little..
Yeah. There is a blueprint (an idea draft, https://blueprints.launchpad.net/androi ... .1.0-ideas) available on Launchpad that mentions presenting the texts better, but I'm in the dark atm as to what is actually needed. Was there anything specific you were missing (you can also edit the blueprint page directly)? Did you try it (if not, you should, it's an app you might want to keep installed)? Did you know that Android's Fortune has been in the market for four months now (http://www.cyrket.com/package/net.lp.androidsfortune), has had 7 large updates (the last for Cupcake including a widget), has nearly 3000 downloads, ... yet is open source and has been translated into 22 languages by volunteers? Also try out my new app, Social Networking Buddy. Time for another update. See attachment.